One of the reasons that I love working in theatre is that it is a collaborative art form. It challenges me and makes me come outside of my private writer’s head. The synergy of a creative team is always inspiring. The Red Kite Toronto Project was one of the most exciting collaborations I have worked on. 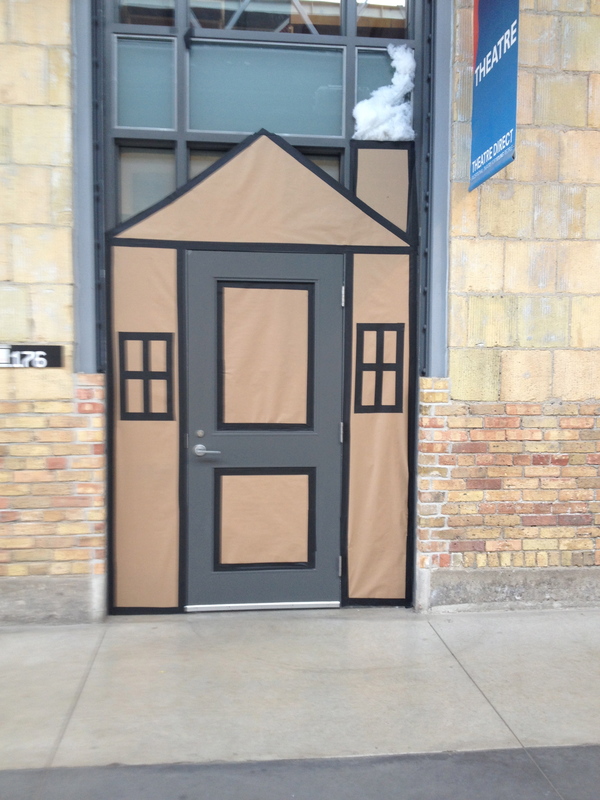 My role was to work with Theatre Direct Canada as the project coordinator and dramaturge on a week of training and creating, leading to a workshop production of a new play for children with autism. The entire Theatre Direct team of actors, technicians, production and education staff was to be involved with the creation of the project. 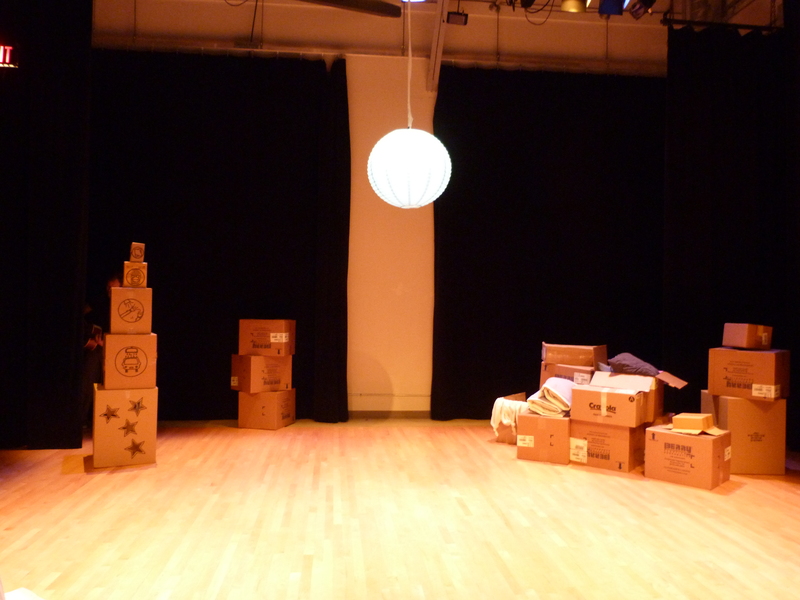 Red Kite, Brown Box was created as a devised piece of theatre, led by director Jacqui Russell from The Chicago Children’s Theatre. What was truly unique to this process was role of designer Andy Miller. 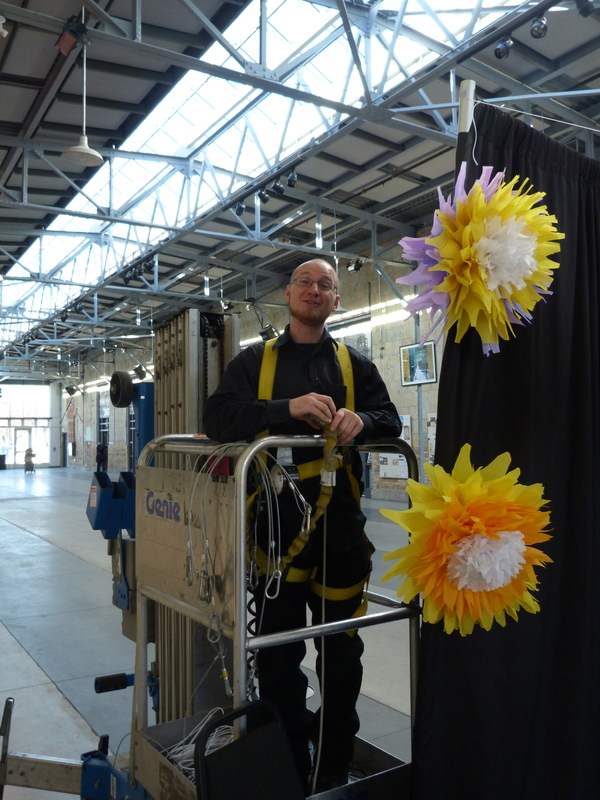 Because the play used few words and was planned as a sensory experience of colour, texture, light and sound, Andy’s job was to create a physical world the stimulated all of the senses. This was not just a play that would be seen. It was a play that would be experienced. The first world for Andy to create was “The House”. This was where our play would take place. 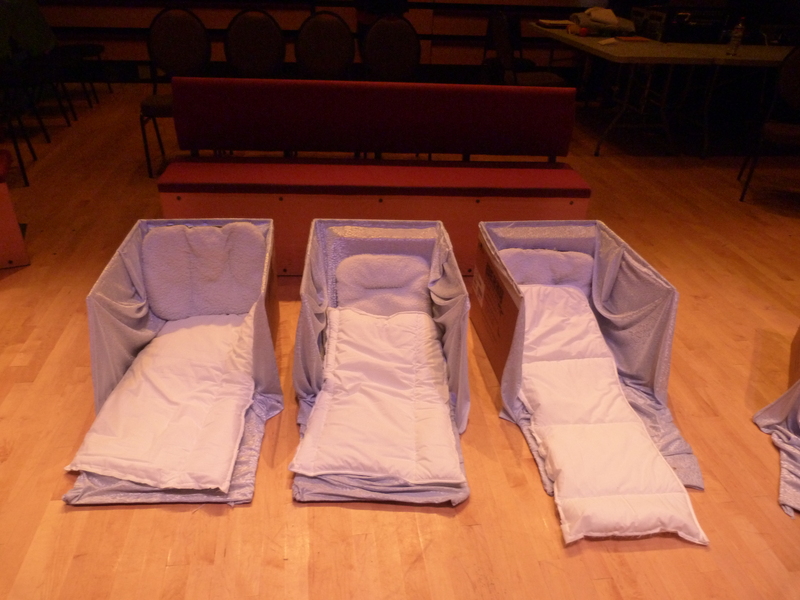 The theatre was set up as a bedroom in the house, filled with packing boxes containing many surprises. The House, filled with packing boxes. The second world that she needed to create was “The Garden”. The Garden was an installation, a “pre-show” in the lobby outside the theatre. The purpose of the installation was to create an unstructured world for the children to explore so that they would have a transition from their world into ours. For the Garden, Andy started us off with a basic structure and a sketch. 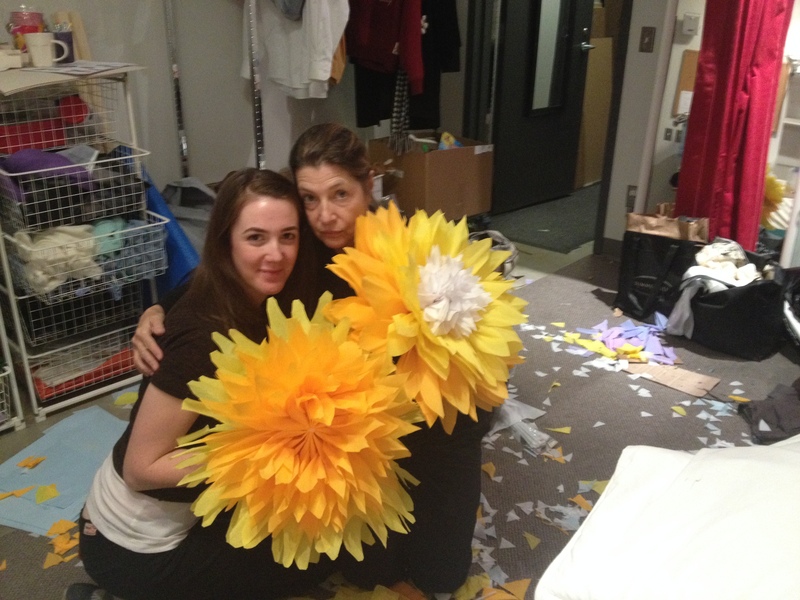 We’d close off an area of the lobby and decorate it with huge paper flowers. We’d set up a tent. We’d make a series of sensory boxes filled with things to discover. Three multi-talented theatre artists and instructors, Michelle Silagy, Carys Lewis and Jessica Runge, came to observe the project and help create the installation. Backstage became a whirlwind of activity, with everyone contributing creative ideas. Hundreds of tissue paper petals were cut to make flowers for the garden. Andy sewed, and sewed, and sewed, making blankets, a tent covering for the garden tent, a huge sheet (large enough to cover the audience), and soft pillows in all shapes and sizes for the pillow fight. She made gobos (design disks that create a pattern when you shine a light though them) for flashlights. The kids would sit under the sheet and shine the flashlight patterns on the fabric. She made a bed for teddy bears and oversized cardboard blocks for stacking. For three intense days Jacqui and the actors improvised the play, and Andy and her team responded. As happens in an exciting collaboration, the process took on a life of its own. 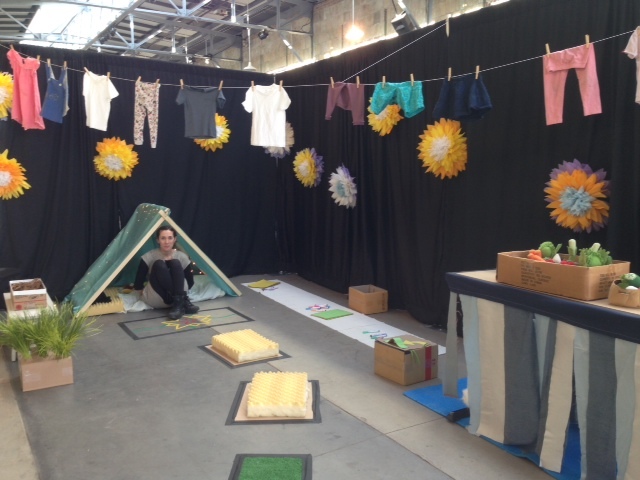 The creation of the garden became a performance piece, a play that was like a-choose-your-own-adventure. No sooner had Theatre Direct technician Dean put up the pipe and drape for our fabric garden walls, than Carys was there affixing the paper flowers, Michelle was making tape drawings on the floor, and Jessica was putting down blocks of bumpy foam and astro turf to make a sidewalk to lead to the tent. We draped soft fabrics and hung corrugated paper that bounced and made a soft sound. There was a clothesline with tiny children’s clothing, and a spray bottle to spray them. There was a tub of water and everyone took turns folding paper boats. Andy made the three sensory boxes: one was foam with slits to “plant” soft plush vegetables; one was a box of dried leaves, with hidden treasures; one was a box of strips of green paper hiding dried pine cones. If you searched you would find two cats in the yard of our house. Our garden was small, but there was much to discover. Looking back on it, my strongest memory of this whirlwind is of the sense of dedication in the room. Everyone was doing this for the children. We wanted to make something special for these special children. Our audience were sixteen children with severe Autism Spectrum Disorder. Some were non-verbal, some had physical handicaps, they had acute anxiety reactions, and a general inability to maintain contact or relationships. No one could predict how they would respond. The only rule was that all behaviours were acceptable. When the children arrived, everything was predictably unpredictable, just as Jacqui said it would be. One child dove into the tent and happily threw crayons for fifteen minutes. Another became totally engrossed in crumbling small pine cones and listening to the hard crackle they made. One child ran erratically through the space, while another had a meltdown and needed to hide. One shredded all of the paper boats in the water pool. One walked around the edges, observing and commenting. One drew, tracing around Carys’ hand again and again, laughing joyfully although unable to say a single word. What appealed to one child was often disregarded by another. We were fascinated by what captured their attention, and what did not. Watching the children was my first small glimpse into the inside of their world. Our actors, the “Smile Family”, came into the garden to meet the children. They sang “Our House” by Crosby, Stills, Nash and Young, and guided them into the theatre. Inside the theatre there was a bed for each audience member to curl up in (made out of a cardboard box and soft blankets), or more likely just to use as a base. Sitting and watching was not necessarily going to be part of the experience. The structure of the play was simple – the actors keep getting into mischief and “Papa Tim” keeps trying to get them to sleep. It was a series of sensory events: a pillow fight, a dance party, flashlights in a tent, a pretend car wash, a lullabye and everyone finally gets to rest beneath the stars. But nothing was predictable in this world. The actors’ responses were dictated by the involvement and engagement of the audience. The unpredictability of the children’s responses was incorporated into the action. Red Kite, Brown Box was a piece of performance art – one of the most intense, exacting pieces of theatre I have ever seen. After the children left, everyone on the team overflowed with excitement. We wanted to see those kids again, right away, to have the opportunity to perform and create for them, be surprised by them, learn from them. From the perspective of their teachers and caregivers, the students were amazingly engaged, and had had a number of breakthroughs in which they expanded their repertoire of responses. It is hard to convey how unique and moving this project was. It was work that stretched us all as artists, and more importantly, as people. The Red Kite Toronto Project was made possible through support from the Ontario Arts Council, an agency of the Government of Ontario. My participation was also made possible through Theatre Ontario’s Professional Theatre Training Program, funded by the Ontario Arts Council. 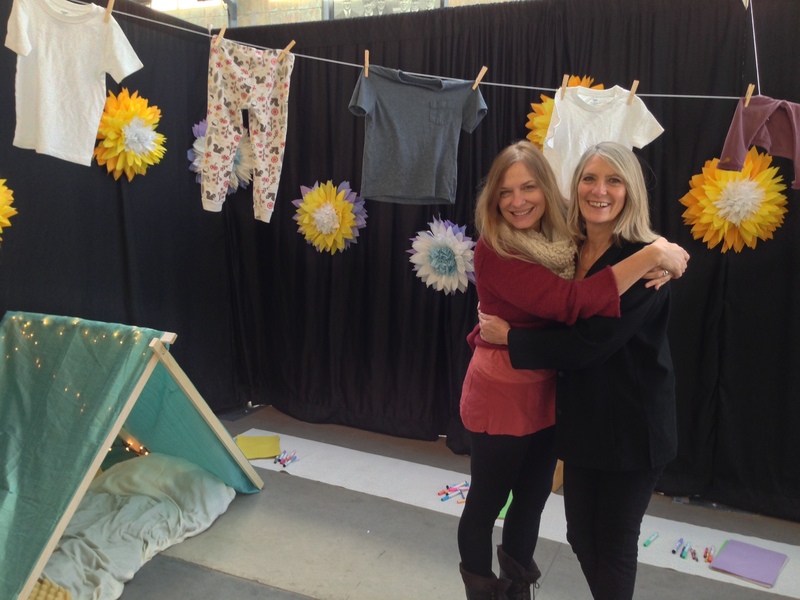 From the great white wildness of Kingston, I find this blog overwhelmingly soothing, thank you Amanda and Laurie for sharing the warmth, beauty and passion of your adventures, so utterly refreshing! Thank you, Nancy. Yes, I find the whiteness/greyness of Eastern Ontario particularly bleak right now, and remembering these colours and tastes really helps!